Is this officially the riskiest selfie of all time? Never mind balancing on the edge of a cliff, British EgyptAir passenger Benjamin Innes took an extremely high-risk shot when he found himself on a hijacked plane in Cyprus. 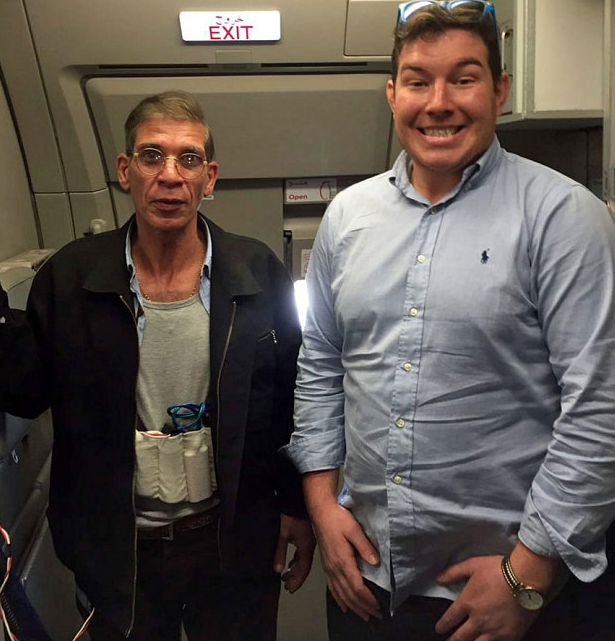 In the photograph Mr Innes from Leeds appeared to be pretty relaxed about the deadly hostage situation when he posed for a picture with hijacker Seif al-Din Mustafa, who appeared to be wearing a suicide vest (though this was later revealed to be bogus). The drama unfolded when Mustafa stood up on a short flight from Cairo to Alexandria, telling passengers and crew that he was strapped with explosives. The plane was forced to make an emergency landing at Larnaca airport in Cyprus, where hostages were held for an hour on the plane before Mustafa began to release most of them, barring Mr Innes and a few others. Mustafa’s demands did not appear to be terrorism-related. While on the plane he issued a series of random demands, including one to see his ex-wife Marina Paraschou, who authorities raced to the village of Oroklini to collect. Brave or completely bonkers? Tell us what you think in the comments below.